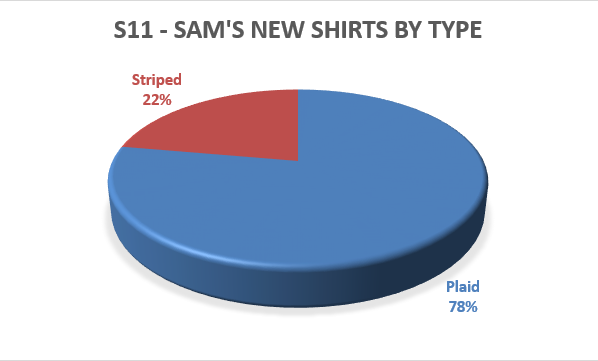 Based on this inventory, it's starting to look like Jared wanted a new shirt for every episode, especially in Season 3. LOL Maybe that's a subtle reminder of Sam's desire to be more "normal" than other hunters. Of course, in reality, to accomodate Sam's wardrobe, he'd need two or three duffel bags. Thanks for doing this. It's very informative. Yes, actually, I've been trying to come up with a good graph that would show how often Sam had one-time-use shirts vs. how often Dean had one-time-use-shirts. 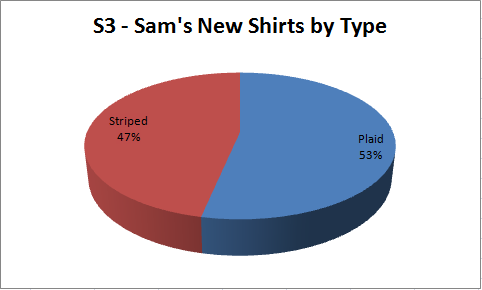 Because, especially in S3, it seemed like Sam had a brand new shirt every episode that then never appeared again. Are you planning on updating this with season six outfits? I will indeed be updating with the season 6 outfits. I have to wait until I get the DVDs though. So, S6 clothes won't start showing up until the fall sometime. Have you given thought to listing footwear? Dean wears logging boots, and Sam's shoes are a mystery that would be great if this site helped out. I know that in Bad Day at Black Rock he's wearing sneakers they don't make anymore. And in Season one and two he would wear low top gray chuck taylors. Actually, one of my friends and I were talking about doing the shoes and boots... my friend would supply the screen-caps and I'd catalog them. I'm not sure when/if that will happen, but hopefully it will! So, yeah, I would very much like to list footwear - it's just a matter of finding the time. THANK YOU!!! You have no idea how much this will help me in the future!!! I know somewhere on here that I said I'd show you the superhero hoodie I got. Thank you again for this wonderul list of awesome! You are an angel, but not the douchebag kind. I love you. I've been circling around a Sam cosplay for ages but was getting really frustrated because, though I did a lot of thrifting and looked at a LOT of shirts, nothing felt right. I didn't want to just grab some random plaid and it just wasn't working for me. Thanks to this, I've realized the major problem is that they weren't western shirts! I live in the northeast and you will almost never find that style shirt in a thrift store, that's why I was failing! But just googling "sam winchester shirts" wasn't showing me what I needed, it took your guidance to get me there. Thank you! I love the idea of maybe finding that exact shirt. Plus it's just really fun to see which episodes things were in. I applaud your diligence! You also gave me the idea to use Sam's hoodie instead of his tan jacket. Again, seems obvious, but I needed it laid out in front of me to see just how many eps it was used in, because I somehow had it in my head that it was a rare thing and nobody would recognize it (because so many Sam cosplayers use the tan). But his hoodie speaks to my soul. You are a blessing to cosplayers. My eternal thanks! Re: Thank you. Bless you. PS - I actually really prefer stripes to plaid, but everyone always talks about Moose as wearing plaid. I feel like this site has given me the ammunition to defend myself if someone gives me crap for wearing a striped shirt. 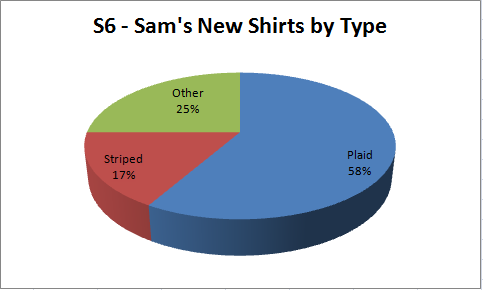 :D I'll prob do plaid anyways just for recognizability, but I feel empowered now. Thanks again! PPS - I really like seeing how the costumers reused shirts from season to season. I agree that Sam would need way too many duffels to hold this many, but it still adds a nice continuity. I've been enjoying thinking about his wardrobe slowly phasing from more normal shirts to more plaid/western shirts as he commits more to being a hunter and phases out his old life. And I agree about needing way too many duffles! And we only ever see Sam with that tiny backpack! 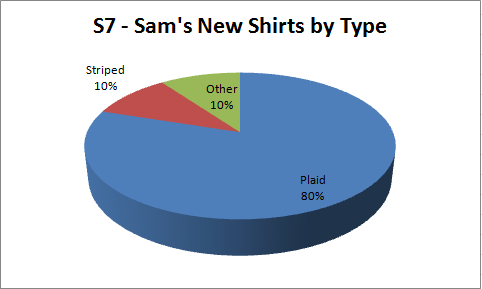 Omg when I said that about his shirts transitioning it was just based on my own memory - I had not noticed that you actually charted it! You're my hero. That's actually why I started this in the first place - I had no idea how useful it would be to artists and cosplayers... I was just interested in how often they wore the same shirts and whether their wardrobe changed at all with the seasons. The fact that artists and cosplayers love me now is just a huge bonus! You're very welcome! I'm so glad I could help! And when it comes to the hoodie vs. the tan jacket - I think it's less about how many episodes they were in and more about how iconic the look is. Sam hasn't worn his hoodie since S6, but for those who watched the first 5 seasons multiple times, the hoodie-look is really the one that stands out the most in memory. Much like Dean's leather jacket, which he hasn't had since S5, but is still the prize piece when it comes to cosplay. I'm also really glad I could help you out with finding a plaid shirt that worked better. 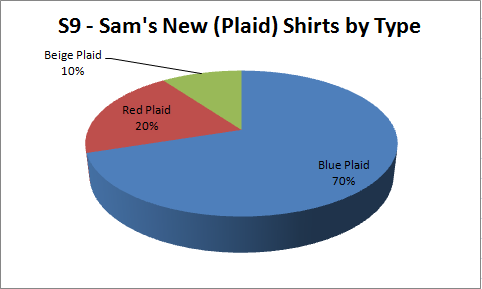 Sam really does love western-style snap-up plaids. If you do find an exact shirt for Sam, let me know - I rely on cosplayers for the Brand info that's sometimes on the entries. I have a very good Dean-cosplayer who's been helping me out, but there aren't too many Sam cosplayers who seem to have the time to send me brand info. Good luck with the cosplay!! Makes sense about the iconic look. S1-3 in particular, and the Kripke years in general, were definitely my favorite. 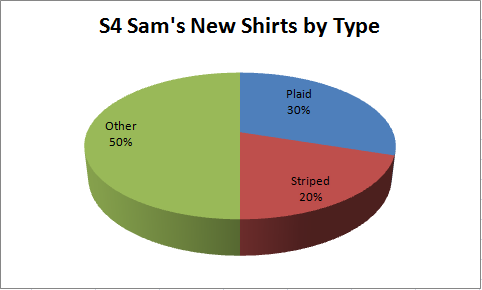 So my image of Sam is a little different than the people who prefer the later seasons. I'm currently doing a rewatch and I swear I almost cried when I saw Dean sleeping under the leather jacket in S4. I miss that jacket so badly. I will definitely pass on any specific info I find! You may already know this, but I can tell you the currently available version of the superhero hoodie is model J130, and there's a women's version WJ130. They look pretty similar to the J25 from what I can tell. The J25 has gone the way of thrifting/overstock luck. Speaking of the hoodie - I've been reading that it's hella warm, and unfortunately I'll be wearing it for summer cons, including Dragon Con. I've been pondering ways to make it more August-in-Atlanta friendly - do you know of anyone who's modified it by taking out the lining or somesuch? I'm not sure how much it might change the look of the jacket or if it's even possible, so I figured I'd check if some brave soul has tried it before me. Thanks for the info about the hoodie! I don't know anyone who has modified it, unfortunately - my suggestion would be to take it to a good seamstress/tailor and see what they say about possibilities. I did once try to buy it for myself, but it was too large when it arrived and I returned it... then I entered the "years of financial trouble" and never tried again. I'm not a cosplayer really, so anything I buy has to be something I'll make use of day-to-day. And yeah, I agree about the Kripke years and getting attached to things. I'm still kind of sad that Sam stopped wearing the hoodie, even though I know it doesn't really suit the character anymore, now that he's in his 30s.